ADJUSTABLE RANGE — The total range within which the actuation point (set point) of a sensor may be adjusted. AMBIENT TEMPERATURE RANGE — The maximum and minimum temperature that will surround the sensor during use and/or test. ANSI (American National Standards Institute) — A federation of trade associa- tions, professional and scientific societies, and individual company members. ANSI approves and serves as a clearinghouse for voluntary, nongovernmental American national standards. API (American Petroleum Institute) — The national trade association that provides information in the form of standards, bulletins, and recommended practices for the petroleum industry. 1996. The Directive is commonly referred to as the ‘ATEX’ Directive (‘ATmospheres EXplosibles’), but may also be called the ATEX Equipment Directive or ATEX 95. BASEEFA (British Approvals Service for Electrical Equipment in Flammable Atmospheres) — (2001) Ltd. (British Approvals Service for Electrical Equipment in Flammable Atmospheres) is the British national testing and certification authority for electrical equipment used in hazardous locations other than mines. Baseefa is a leading internationally recognized certification body for explosion protected equipment, delivering both IECEx and ATEX certification to customers around the globe. Depending on the category of equipment involved, manufacturers are also required to install a quality system that ensures that a product that has been type examined will be faithfully replicated. SIRA — A world leader in the conformity assessment solutions field, specializing in explosion safety of equipment used in potentially explosive atmospheres (ATEX & IECEx). As a leading Notified Body for Ex Product Certification (ATEX & IECEx), Sira sets the standard with a range of ATEX 137 & DSEAR, ATEX Quality Assurance, IEC 61508 Functional Safety, Training and Personnel Competence Certification services. In 2009, Sira became a CSA International company and provides certification to North American requirements. CHARGE — The fluid with which the temperature sensing probe is filled. CRITICAL SET POINT — The critical set point is the set point of the unit which is held to the closest tolerance. It can be either the actuation (increasing) or deactuation (decreasing) point. CSA (Canadian Standards Association) — A nonprofit voluntary association engaged in standards development and certification activities. A CSA certified electrical product conforms to applicable requirements of the Canadian Electrical Code. Representative prototypes are tested prior to certification and CSA maintains a production surveillance program to ensure continuing conformity. DOUBLE BREAK SWITCHING ELEMENT — A double break switching element has two isolated circuits; one normally open and one normally closed, the four terminals facilitate wiring. is in an actuated condition. If the pressure then drops and the switch deactuates (returns to its normal condition) at 90 psi, it is said to have a dead band of 10 psi. NOTE: CCS dead bands are within +/- 50% of the published value. 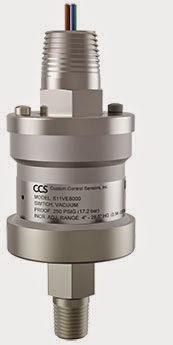 DUAL SEAL — The imminent Canadian national code adoption of NEC 2009 required process instrumentation such as flow, level and pressure gauges, meters and switches, to certify their devices to the ANSI/ ISA 12.27.01 standard. Supplying a device with a nameplate labeled “Dual Seal” or “Single Seal” meets the NEC 2009 code, and permits an end-user installer to eliminate a costly secondary seal. DUAL SETTING — A dual setting pressure sensor has two independently adjustable electrical switches that are actuated by a shared pressure source. Equivalent to two field adjustable pressure switches in one package. FACTORY SET — Switch which can be set only at the factory to customer’s requirements. FIELD ADJUSTABLE — A pressure switch design that provides for adjustment of set points in the field. FIELD SET — A pressure switch design that provides for field adjustment of set points. Adjustment is accomplished by turning an adjustment screw located inside of pressure port prior to installation. After unit is installed, set points can be adjusted by removing pressure fittings to access adjustment screw. FIRE RESISTANT — A pressure sensor that is designed with a high melting point barrier (steel) that will prevent full flow of sensed flammable fluid from feeding an externally caused fire. GOLD CONTACTS — Gold contact switching elements are characterized by high corrosion resistance and high reliability in switching low voltage and amperage circuits. They are recommended for intrinsically safe and computer interface circuits. GOST: (Russian: ГОСТ) — Refers to a set of technical standards maintained by the Euro-Asian Council for Standardization, Metrology and Certification (EASC), a regional standards organization operating under the auspices of the Common- wealth of Independent States (CIS). These are GOST-R, GOST-B, GOST-U and GOST-K certification trademarks demonstrating product compliance to Russia, Belarus, Ukraine, and Kazakhstan. a sensor so that it is unaffected by all ambient external corrosive agents and explosive gases. Sealing must be accomplished by soldering, brazing, welding, and glass to metal fusion. to Standards relating to equipment for use in explosive atmospheres (IECEx System). IECEx Certified Service Facilities Scheme Assesses and certifies that organizations and workshops that provide repair and overhaul services to the Ex industry do so respecting the strict requirement of IEC International Standard 60079-19. LIMP DIAPHRAGM — An elastomer or plastic diaphragm which is used in a pressure sensor. This type of diaphragm conforms to the shape of the sensing pressure plate and has no rigid structure itself. CCS uses polyimide, stainless steel or viton/dacron limp diaphragms. Stay tuned ... more to pressure switch and temperature switch terms to come in Part Two.